A U.S. Army-owned facility produces a range of projectile parts for artillery systems, and handles 100 percent of its steel-manufacturing processes inhouse. The 100-plus-year-old facility, one of the most technologically advanced plants in its early years, had undergone renovations over time to adapt to changing products and technologies. Recently, with new work and limited shop-floor space, and the need to address time-consuming changeover of press tooling weighing in excess of 15,000 lb., the facility sought a quick-die-change (QDC) remedy. This schematic shows the layout of a munitions manufacturer’s new quick-die-change system, which has reduced changeover time from days to less than a single shift while overcoming challenges related to press-cell configurations and space limitations. Munitions production features long press runs with infrequent tool changes. Within the facility, heavy tooling was brought piece-by-piece to be assembled in the press, a days-long process. Taking on additional work would require more-rapid tool changes between production runs. The ideal solution would involve moving tools into and out of the presses fully assembled, but the building, limited in space, would not allow that. As a result, QDC installation would require low-impact methods with minimal construction. But working within the existing infrastructure presented many problems. The assembled tools weighed approximately 16,000 lb., and when combined with the weight of the equipment needed to move them, the engineered flooring covering the press pit would not support the load. Restricted space presented another problem: Presses contained in the facility’s workcells did not offer enough space between them for navigating a forklift carrying the fully assembled tools. And, the presses rose several stories, which eliminated the option of employing overhead cranes to assist in die changeover. In addition, bed/bolster heights measured 6 in. below floor-level, and a common aisle capable of supporting tool and equipment weight was located several yards away. Finding a solution involved a detailed interaction between the munitions plant’s engineering team and QDC specialist Serapid, Inc., Sterling Heights, MI. This sideview shows how a trolley and elevator setup helps ease transport of tooling onto press bolsters, which sit 6 in. below floor-level. The targeted manufacturing process includes three press cells, with two cells containing two presses each and the third cell outfitted with a single press. The plan: Install one die changer to service each cell. The dual-press cells, as mentioned, feature bolsters on a common height 6 in. below floor-level. After the upgrade, personnel assemble tooling elsewhere in the shop, transport it by cart to the press cell, then place it on the QDC system’s trolley. 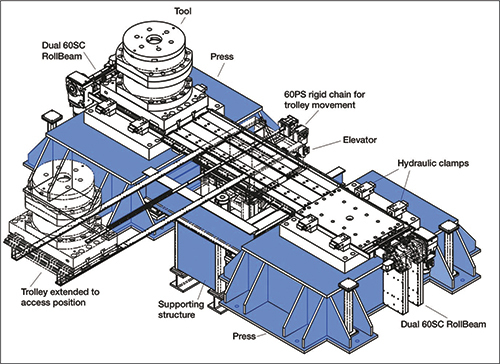 The trolley then transports the tool to an elevator within the press cell, which raises and lowers it, thus eliminating the issue of the 6-in. height difference from floor to bolster. The tool then moves into the press bed, is clamped and ready to use. Changeovers occur within minutes, although other associated processes extend the total time needed. The tooling transfers to and from each press bolster on lubricated, replaceable brass wear strips via Serapid Dual RollBeam 60SC chain units mounted to each press bed. The elevator uses a single Serapid 100R LinkLift column, more than capable of lifting the 16,000-lb. tools. The trolley travels on and off of the elevator on tracks via a Serapid 40PS chain that positions the tool either in the aisle or on the elevator. The weight of the system and tools distributes across the floor of the press pit and is supported by existing concrete piers in the pit. With the exception of the clamps, the entire system is nonhydraulic and completely electromechanically powered.